Hermès is launching a new interpretation of Eau des Merveilles, a blend of amber and woods developed in 2004 by perfumers Ralf Schwieger and Nathalie Feisthauer. 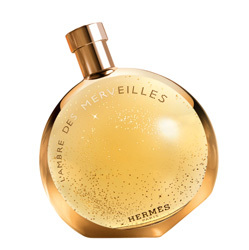 L’Ambre des Merveilles is created by Hermès in-house perfumer Jean-Claude Ellena. Ellena already reinterpreted Eau des Merveilles as the gourmand L’Elixir des Merveilles and mossy Eau Claire des Merveilles.